If you prefer casual style, why not take this combination of a dark green floral bomber jacket and Michael Kors Michl Kors Polarized Aviator Sunglasses for a walk? Add white canvas high top sneakers to this ensemble to instantly change up the outfit. Why not try pairing a grey satin blazer with silver sunglasses? These items are super comfortable and will look great matched together. White leather low top sneakers look right at home here. Combining a black cropped sweater with silver sunglasses is a good choice for a relaxed but totaly chic look. To give this outfit a smarter aesthetic, why not introduce a pair of black leather over the knee boots to the equation? For an outfit that offers function and chicness, wear a charcoal print sweatshirt and Michael Kors silver sunglasses. Dial up the formality of this getup a bit by slipping into a pair of black embroidered suede heeled sandals. A light blue fur coat looks so casually stylish when paired with Michael Kors silver sunglasses. Black suede ballerina shoes are the glue that will bring this ensemble together. 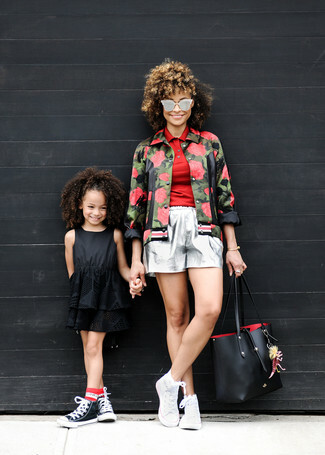 A red suede bomber jacket and silver sunglasses are absolute must-haves that will integrate really well within your daily repertoire. 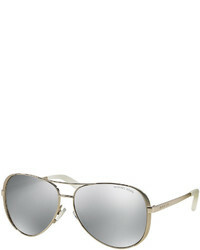 Why not consider teaming a silver hoodie with Michael Kors Michl Kors Polarized Aviator Sunglasses? As well as very functional, these pieces look fabulous worn together. To add a bit of flair to your look, complete this look with a pair of black leather oxford shoes. A light blue leather biker jacket and silver sunglasses are both versatile essentials that will integrate brilliantly within your daily wardrobe. To give your overall outfit a more refined spin, complete this outfit with a pair of pink leather heeled sandals. 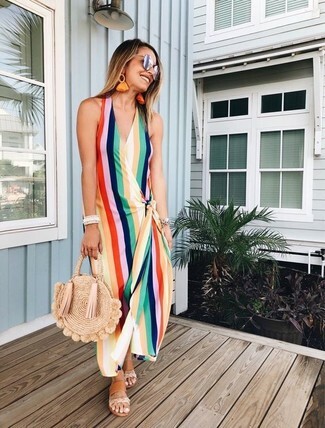 Go for a pared down yet casually cool option combining a multi colored vertical striped maxi dress and Michael Kors silver sunglasses. Tan leather flat sandals are a winning footwear option that's full of personality.